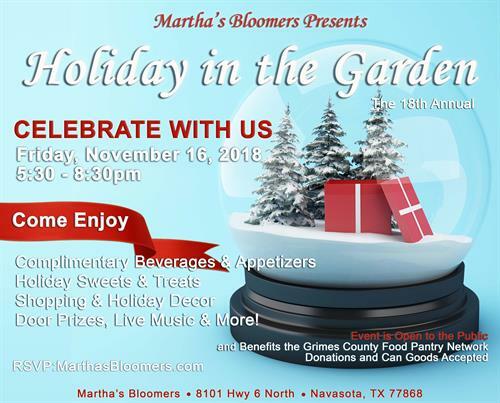 Join the Celebration for our 18th Annual Holiday in the Garden, presented by Martha's Bloomers – Friday, November 16th - 5:30pm to 8:30pm. Share in an evening of holiday fun with family and friends! 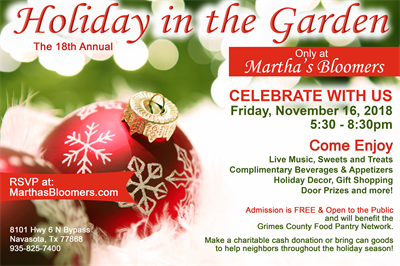 Enjoy Live Music, Sweets and Treats, Complimentary Beverages & Appetizers, Holiday Shopping, Door Prizes and more! Admission is FREE and open to the public. Event will benefit the Grimes County Food Pantry Network. Charitable donations and can goods being accepted at event to help our neighbors throughout the holiday season!